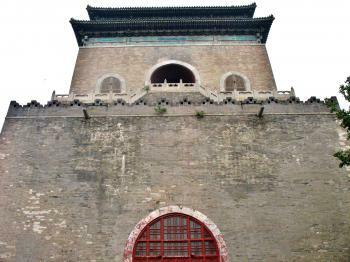 The Central Axis of Beijing (including Beihai) is part of the Tentative list of China in order to qualify for inclusion in the World Heritage List. The Central Axis of Beijing is an impressive line of monuments and important structures that represent the power of the state. While the central axis already includes 2 world heritage sites (Imperial Palace & Temple of Heaven), the current nomination would also include the magnificient Bell and Drum Towers. The various properties that make up the nomination link what could be considered "Old Beijing". 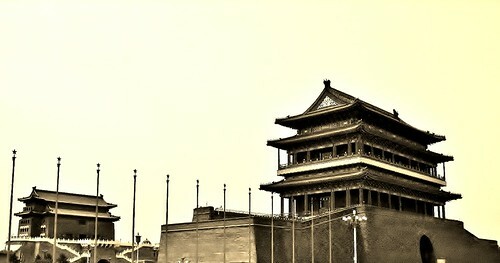 While much has been rebuilt, particularly in and around Tiananmen Square, the central axis was tradtionally the most important area of Beijing. The same could be said for Beijing today. The architects of post-1949 Beijing did not forget the central axis in their transformation of the capital. I've had the great pleasure to visit the Imperial Palace and Tiananmen Square on two different occasions. I visited the Temple of Heaven in 2006. However, for me the properties that stand out which have not yet been inscribed are the Bell and Drum Towers. During my visit to both sites in 2007, I was fascinated with the urban planning of old Beijing, and how the capital operated. These two monuments offer incredible views of the central axis (on a clear day). Furthermore, the best preserved Hutongs are located near these impressive structures. Beihai Park which has previously sought UNESCO inscription, is making its 2nd atempt in this serial nomination. Beihai is a fantastic place to visit, the White Pagoda is impressive, and the gardens are nice to stroll through. My visit was enjoyable, but compared to the Summer Palace, it did not leave a strong imprint on my memory. I am curious how the World Heritage Committee evaluates this nomination. The nomination will undoubtably have high priority on the current list.